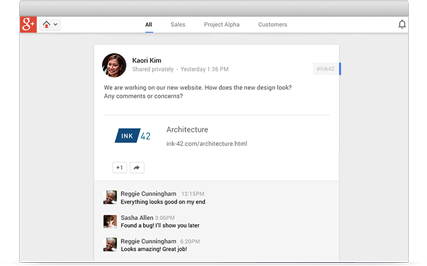 A social network designed for businesses. 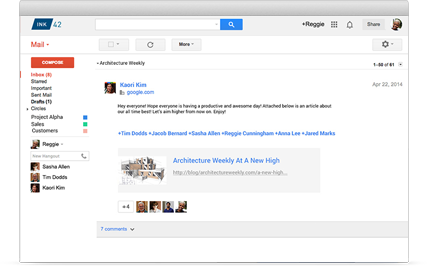 Share insights, questions, and content with your customers and team members. Google+ has the perfect audience for every question or idea. Share your thoughts with a specific Community or share a question with your entire organization. Organize your social connections in a way that is unique to you. Filtering helps make sure you hear from those that inspire you and share with those you want to hear you. 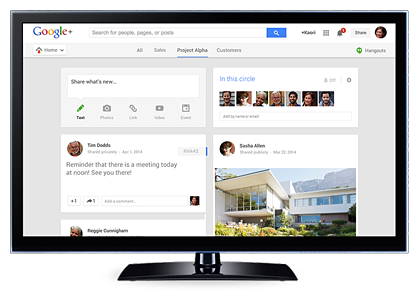 Google+ integrates perfectly with your email, calendar and docs to help you work smarter. You can filter your inbox using Circles or post a survey to get instant feedback. With enhanced privacy controls, you can pick default settings for different groups, like one for your internal teammates, and another for external vendors. The Google+ app for Android and iOS lets you share on the go. Share locations, photos you’ve snapped on a business trip and have them instantly saved and ready to share.